V Three Hospitality Equipment, one of the finest manufacturers, suppliers and traders of this impeccable range of Cooking & Mixing Equipment, established its operations in the year 2011. 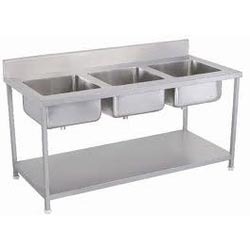 The products offered by us include Commercial kitchen equipment, Kitchen equipment and SS Fabricated Kitchen Equipment, having a high demand in the market. Manufacturing of these products are done in compliance with the set industry norms and guidelines, utilizing the finest raw materials and modern machines. This ensures the product’s performance, strength, capacity and service life. In addition to this, the range is marked at the most reasonable rate possible. For reasons of managing the operations of the firm, in the most effective manner, our infrastructural facility has been parted into a number of highly operational units. These units, in the most effective manner, help us in the attainment of a number of the firm’s predefined goals and objectives. The facility, laced with all the necessary machinery and equipment, help us maximize the firm’s productivity. The facility’s regular up-gradation, help us maintain our position in the market. In addition to this, we have a huge client base, owing to our ethical work practices.